I saw a project on Pinterest in the fitness category awhile back that was intriguing. And like the menu planner, I knew it needed a little tweaking to work for me. It’s been a work in progress, but this feels like a good time to share about it anyway. The original project has two matching jars painted with a variation of “Pounds To Go” on one and “Pounds Lost” on the other. They’ve got marbles in them to represent pounds or half pounds and as you lose weight, you’re supposed to move a marble from one jar to the other. I tried it once, and it ended up being just another way to fail because I just don’t shed pounds easily and it was depressing to stare at that full jar every day. And then I realized that I was going about it all wrong, and I could use some of the skills from my job to put together a version that would work better for me. At work, I keep a dashboard of all our marketing campaigns. I track how many people see each message, how many people visit our website, how many call or email us for more information, and how many ultimately make a purchase from us. Our main goal is, of course, to make that last number as big as possible, but – here’s the big secret – you can only do that by making changes to the other numbers. There’s no way for me to make an extra 50 or 100 people make a purchase. But if I can place a message in front of 10,000 people and 1000 of them visit my website, where 100 of them contact us for more information, and I do that over and over and over again, I will get my 100 new customers. The more you look at the numbers and figure out where you are falling behind in that conversion to the next level, the better you’ll get at knowing where to make changes to help boost the process along. 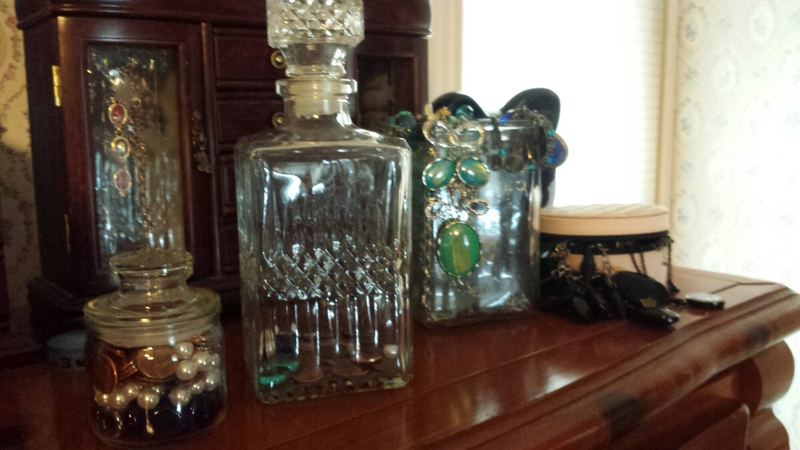 So, I took that idea and put it in a jar that lives next to my jewelry box, where I see it every day. I added pearls to represent inches I need to lose to fit into my long term goal dress size. Then I added stones to represent pounds to lose along the way to my long term goal. And last, I added a penny for each of the 30 sessions in my workout program. Every day after my workout, I move a penny from the “goal” jar to the “done” jar. And on my check in days, I move stones and/or pearls over for any inches or pounds I’ve lost. At the end of my first program, my done jar had 30 pennies, 6 pearls, and 4 stones in it. If it had just had those lonely little stones in it after all that work, I probably would have quit. Again. But making the work part of the goal itself made a huge difference for me. I didn’t feel like I had failed because I only had 4 stones, I felt like I was really making progress because my “done” jar was starting to fill up. So I gave myself the reward I had promised myself for finishing the program, and added 48 more pennies to the “goal” jar for the workouts in my next program. I have rewards planned for myself as I move those stones and pearls too, and it feels really good to see that pile of pennies stacking up in the bottom of the jar! I’m already thinking about what program I want to do next – any suggestions? What keeps you motivated? Does it make a difference if you are at a point where your goal seems far away, or right around the corner? What kinds of rewards do you give yourself for meeting your goals? I’d love to hear about them all!